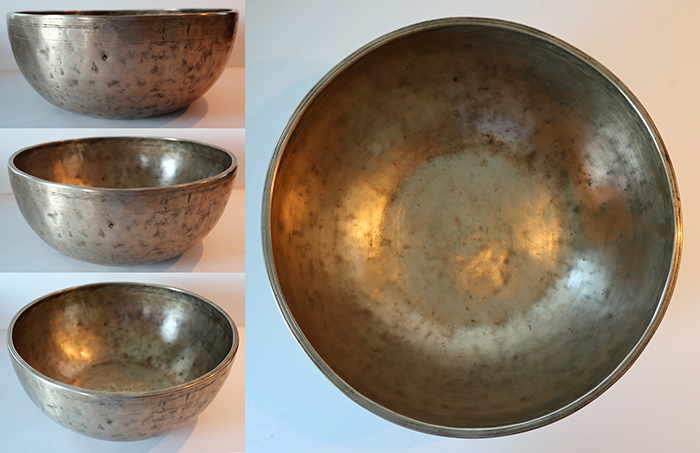 This huge top quality Antique Jambati Singing Bowl is a real heavyweight at a little under 3 kilos, and its thick walls would have proved a challenge to forge evenly. The curved wall, flat bottom, and relatively low profile make it appear even larger than it is. It has a grooved lip, faint circles at the centre, and decorative bands forming a collar around the outer rim. The fundamental note is pulsating perfect pitch middle F (350Hz) with a massive sustain when struck with a padded mallet or played around the rim. There is also a Bb2 harmonic present. The rim note changes to a powerful and penetrating fifth octave E (678Hz) with a wooden ringer. This bowl is best played with it resting on a cushion or mat, because its weight makes it difficult to hold for more than a little while. This substantial and handsome 19thcentury bowl has a real presence and would grace any collection. It is in excellent structural condition, clean and free of stains and blemishes. Listen: (2 struck notes and 2 played notes, suede ringer then wood).